Polyclonal antibody raised in rabbit against MeCP2 (Methyl-CpG-binding domain protein 2), using a KLH-conjugated synthetic peptide containing a sequence from the C-terminal part of the protein. ChIP assays were performed using human osteosarcoma (U2OS) cells, the Diagenode antibody against MeCP2 (Cat. No. pAb-052-050) and optimized PCR primer sets. Sheared chromatin from 1x10e6 cells and 5 μg of antibody were used per ChIP experiment. IgG (1 μg/IP) was used as a negative IP control. 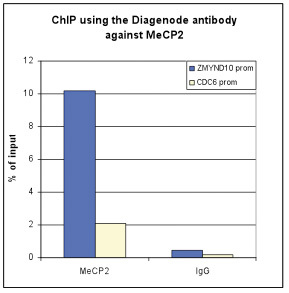 Quantitative PCR was performed with primers for the promoters of the ZMYND10 gene (used as a positive control) and CDC6 gene (used as a negative control). Figure 1 shows the recovery, expressed as a % of input (the relative amount of immunoprecipitated DNA compared to input DNA after qPCR analysis). To determine the titer of the antibody, an ELISA was performed using a serial dilution of the Diagenode antibody directed against MeCP2 (Cat. No. pAb-052-050) and the crude serum. The plates were coated with the peptide used for immunization of the rabbit. By plotting the absorbance against the antibody dilution (Figure 2), the titer of the purified antibody was estimated to be: 1:32,900. 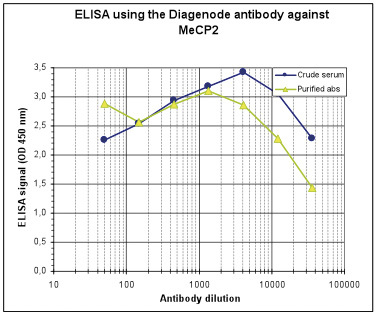 Nuclear extracts (40 μg) from HeLa cells were analysed by Western blot using the Diagenode antibody against MeCP2 (Cat. No. pAb-052-050) diluted 1:1,000 in TBS-Tween containing 5% skimmed milk. The position of the protein of interest is indicated on the right; the marker (in kDa) is shown on the left. Whole cell extracts (40 μg) from HeLa cells transfected with MeCP2 siRNA (lane 2) and from an untransfected control (lane 1) were analysed by Western blot using the Diagenode antibody against MeCP2 (Cat. No. C15410052) diluted 1:1,000 in TBS-Tween containing 5% skimmed milk. The position of the protein of interest is indicated on the right; the marker (in kDa) is shown on the left. 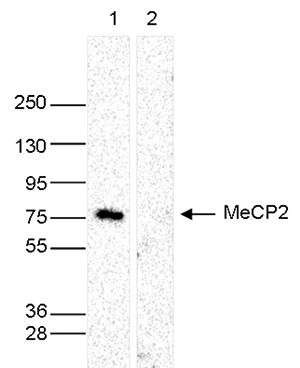 Diagenode strongly recommends using this:	MeCP2 polyclonal antibody - Classic (Diagenode Cat# C15410052 Lot# A20-0042). Click here to copy to clipboard.